There are Eighty Two (82) RTA Disable Bays on campus. Nineteen (19) of these bays are located in the Residential Precinct of the campus and Sixty Four (63) bays in the Academic Precinct. 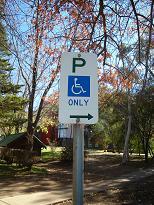 To be eligible to park in a Disable Bay the vehicle must display a valid RMS (Roads & Martime Services) Mobility permit. The RMS Mobility Parking Scheme permit entitles you to park in spaces marked with a symbol for people with disabilities. The permit also provides parking concessions in other spaces. When parking in a Purple or Blue permit parking area there is no charge. Where parking is signposted in excess of 30 minutes, the vehicle can park for an unlimited time. Where parking is signposted as 30 minutes, the vehicle can park for 2 hours. Where parking is signposted as 15 minutes or less, the vehicle can park for a maximum of 30 Minutes. Note - RMS Mobility permit holders are not permitted to park in Red bays with this type of permit. Who requires the use of crutches, a walking frame, callipers, scooter, wheelchair or other similar mobility aid. Please note that a Mobility Parking Scheme permit does not allow vehicles to stand or be parked between "No Stopping" signs or on Taxi stands, bus or in loading zones. Vehicles that display the RMS Mobility Parking must park in a designated parking bay in accordance with the UNE Parking Policy & Parking Procedures. Find information regarding the RMS's Mobility Parking Scheme. The University is able assist staff and students who have sustained a temporary injury or illness by issuing a UNE Temporary Mobility Permit to those who otherwise may not be eligible for assistance under the RMS Mobility Parking Scheme. Staff and students who are registered Parking Permit holders are eligible to apply for a Temporary Mobility Permit by contacting Safety, Security & Information in either of their two offices on campus. Holders of a UNE Temporary Mobility Permit are permitted to park in Blue & Green Permit bays as well as Loading Bays only. Persons who do not meet the criteria for a UNE Temporary Parking Permit may make special application to Parking Administration located at Facilities Management Services located in building N005 for consideration.